Enjoy this undammed free flowing river as it flows through pristine canyons with beautiful rock formations and very exciting rapids. Featuring almost continuous technical whitewater rapids, you’ll slalom through Chamberlain Falls, Bogus Thunder, Staircase, and many more. While a hearty deli lunch is served along the river you can enjoy the spring wildflower display, lush foliage, and abundant wildlife. The last few miles of your adventure offer a slower pace allowing you to catch your breath, relax and enjoy the beautiful scenery of the canyon. The North Fork of the American River is free flowing and the water flows depend entirely on snow-melt and rainfall. The North Fork is considered one of the best Spring rafting trips in California! 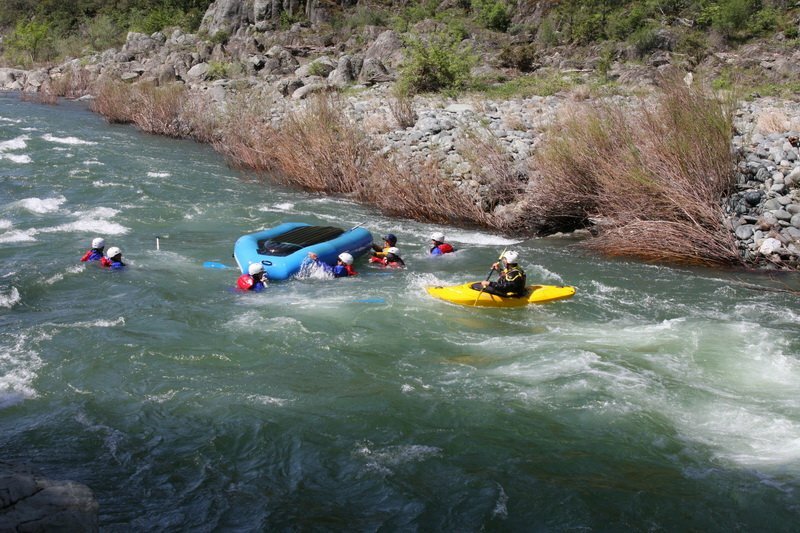 It’s a true wilderness rafting experience with some of the most technical rapids rafted in California. This stunning 9-mile section of North Fork of the American River dominated by American Whitewater Expeditions and we are leading the way and setting the standard! We have the best and most experienced guides on the North Fork whose sole job is to make sure you have a fantastic and safe time on your river trip. The North Fork rafting trip is an intermediate white water river featuring steep drops, lots of action and some very technical rapids. This is a perfect rafting trip for adventurous first timers and those who have rafted before but who want even more action, seclusion and beauty. The North Fork rafting trip has a minimum age of 14 and all participants have to paddle and be active participants on the trip. With the best and most experienced guides on the North Fork guiding your raft you will have an fantastic day of whitewater rafting on this amazing Spring river. Your North Fork rafting adventure begins early as you head out of our River Camp around 7:30 AM. There is also an option for rafters to be picked up in Auburn at 8:00 AM. You can also take advantage of FREE camping the night before your trip! The start times on the North Fork do vary slightly with the river flow and we will contact you and advise accordingly. After breakfast we head out to the North Fork, passing through the gorgeous American River canyon and past Auburn and into the heavily forested Sierra Nevada foothills. You will arrive at the put-in about an hour later and your guides will unload the rafts, get you all your safety gear and give you a detailed Safety Talk. After the safety talk each raft will be taught how to paddle as well as follow commands – then you’ll practice for a good 10 to 15 minutes because the first 4 miles of the trip is fast paced with continuous rapids. Once on the water the action starts right off the bat with Slaughters Sluice which leads into one of the biggest hits on the river at Chamberlin Falls. The rapids continue one after the other, Tongue & Groove, Zig Zag, Achilles Heel and Bogus Thunder with the infamous “Toaster” where interesting out of boat experiences do occur. This leads into smaller rapids and then back into the thick of it with Grand Slalom, Staircase, Nose Stand and many more. Soon you’ll float past the Yankee Jim Bridge and Indian Creek! From here on out for the next several miles the river takes on a more gentle and enjoyable tone! You’ll stop along the way for a hearty lunch, soak in the sun and relax a little and swap stories of the rapids run. Enjoy more of the beautiful canyons until you reach the take-out around 2:30 – 3:00 PM. This trip can end earlier or later depending on the water level! At take out the rafts are loaded and you will have an opportunity to change out of your wet-suits and into dry clothes. At take-out we also serve cold drinks and water for the drive back to Auburn or our River Camp. There are limited spaces available on the North Fork and weekends fill up fast so book soon! Give us a call at 800-825-3205 and let us show you a time on the North Fork rafting trip. FREE Camping the night before your trip. FREE 2 Person & 4 Person Tents – Set-up before you arrive. FREE Wet Suits and Splash Jackets. Please keep in mind the North Fork is a natural free flowing river fed by snow-melt and rain. The rafting season on the North Fork varies and this year we are anticipating a long season. We will likely be rafting the North Fork during the months of March, April, and May. Please call us for details 800-825-3205. Our Spring North Fork rafting trip is offered every day of the week departing from our River Camp in Coloma or at our Trip Meeting Place in Auburn. The meeting times vary depending on trip size, availability and river flow. The meeting time for the North Fork is typically between 8:30 AM and 9:30 AM. Get ready for some North Fork rafting action! Check out our Equipment List for items you will need for your trip as well as Maps and Directions to our River Camp in Coloma as well as Maps and Directions to our Auburn Meeting Spot. If you are camping with us, breakfast before your trip can be added with advanced reservation. Additional nights camping after the trip is also available. Please call 1-800-825-3205 or email us for details. Group Specials For every 5 paid rafters the 6th goes for 50% off. For every 11 paid rafters the 12th goes for FREE. Groups of 12+ call for Special Group Price. NOTE: Prices are per person and there is an 8% Govt Land & River Use Fee added to all prices above.